i recognize that i was veryyy lucky to have a solid month of break, and that this monday is day 1 of week 1 for me, and that i had the opportunity to fill that break with day trips to san francisco, lake tahoe and santa cruz, unlimited baking, and catching up on (and then getting deprived again, it’s a never ending cycle) sleep. but now i’m back at school, and already dreaming of the weekends. of volunteering at disneyland, of a retreat to the lake and mountains, of a friend visiting me so we can theme park (maybe universal studios instead of the usual disneyland) it up. not paying attention to marketing lectures at 8am. in this return to real life with responsibilities and things to do besides baking/reading/hanging out/sleeping, i bring you broccoli gribiche, because my diet needs to be less toasted almond ice cream and more broccoli. 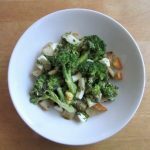 there’s tender broccoli, soft/creamy egg and crunchy potatoes, all in a zingy, herby dressing (if you happen to have chimichurri on hand, highly recommend using that in place of making a separate dressing). considering how my lunches at school usually consist of hummus and carrots/cucumbers or cold tofu dressed with soy sauce and sesame oil, broccoli gribiche is basically my dream lunch. 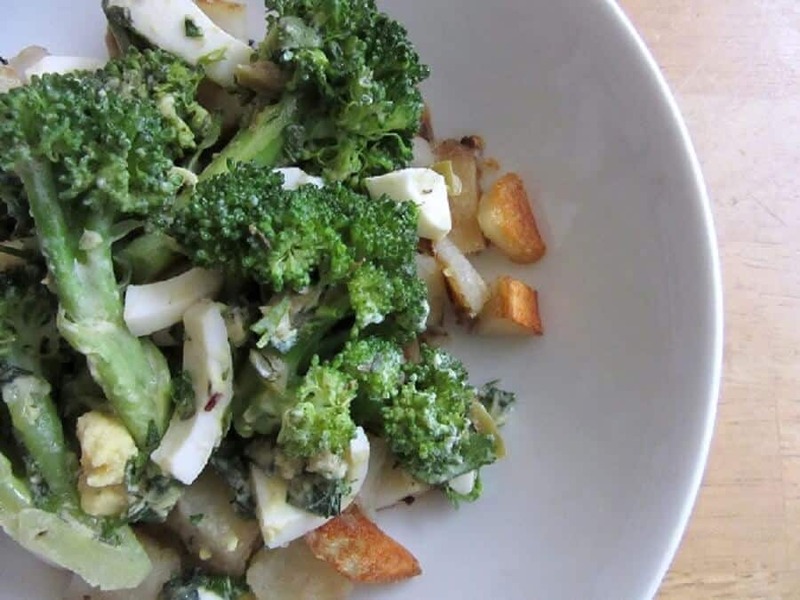 The dressing for this broccoli, potato and egg salad gets its creaminess from mashed egg yolk instead of mayo or sour cream. Toss the potatoes with some oil and salt. Spread out into a single layer on a baking sheet. Toss the broccoli with garlic, plus some oil and salt. Turn the broccoli out onto a baking sheet. Roast all vegetables at 400F for 15 minutes. 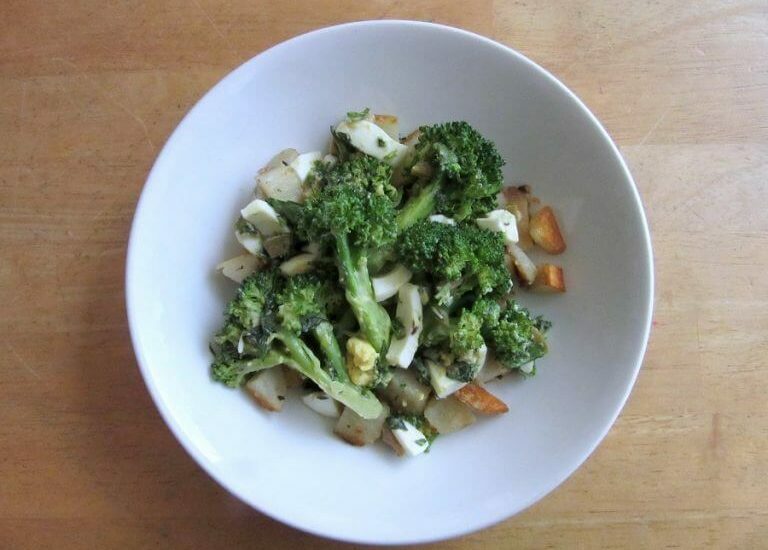 Alternatively, you can saute the potatoes and broccoli separately, until the potatoes are golden and fork-tender, and the broccoli is crisp-tender. Mash the egg yolk. Slowly whisk in the oil. Whisk in the mustard, then the vinegar. Add the shallots, capers and herbs, mixing well. Chop the remaining eggs and fold them in. Combine the potatoes, broccoli and dressing, tossing everything to coat. Serve immediately for crispy potatoes, or in a couple hours after everything marinates. Adapted from Heidi Swanson’s Super Natural Every Day. Herbage wise, she used parsley, tarragon and chives. I like any combo involving cilantro, basil, thyme and oregano. You can add some dried herbs, but the majority should be fresh! Yum! This looks super tasty!!! I love eggs mixed with veggies. But not scrambled – I actually PREFER hard boiled eggs chopped up with veggies, so this recipe is right up my alley! Oooh I bet chimichurri would be good with this, a very healthy meal (and delicious too I bet!). This is the first time I am seeing this recipe. It is definitely worth trying! thanks agness! i hadn’t heard about it until i came across this recipe a couple of months ago either, so i feel like it might be a little unknown outside of france. I dunno why but I didn’t think you were in school! That’s really cool that you were able to take time away from school and just hang out and catch up on sleep. I feel like as we run around doing everything, sleep becomes an old memory. Like, “Remember when we used to sleep, those were great times.” Welp, now that you’re back I do think it’s cool that you can still pull some time to make a plate or two. You manage to make such simple yet really delicious looking plates and this one is no exception! I really like the egg and potato in this one. Don’t get me wrong, the broc is great too but potatoes?! Any day! yup! that college life though. i could have potatoes roasted, fried, mashed, etc all day and be perfectly happy (though if we were talking best potato day ever, i’d go with roasted potato wedges, curly fries, buttermilk garlic mashed potatoes, oooooo already salivating). And I also looove broccoli and eggs… I’m going to try it with “mandioquinha”, a cousin of potato here in Brazil… Kisses, and thanks a lot! oooh, i’ve never heard of mandioquinha before! it sounds tasty though (wikipedia said it tastes like a combo of celery, cabbage and roast chestnuts, and the chestnut part sounds so good). does it get crispy like potatoes when you cook it?